It’s National Learning and Development month, and here at Abilitie, we’re using this national month-long celebration of skill-building and professional development to share our favorite, thought-provoking resources with our network of L&D professionals. We’ve also consolidated our most-read articles from our own blog in hopes of helping to accelerate you down the path towards professional excellence. Enjoy! At our core, we are a company that believes in the transformative effects of training & development. Much is written in the business press about mega M&A deals, billion dollar strategic investments, and global advertising campaigns...this isn’t one of those articles. Instead, I wanted to look at lessons we can all learn from three stories about the power of ingenuity paired with very little capital. When an organization seeks to bring about change, the team will often work with a consultant to help them see things they can’t see themselves. We’re often too close to our own organizational problems to be able to see them clearly. The same can be said for an individual — which is where a good coach comes in. A coach can help you in the same way a good change consultant can help an organization: by spotlighting your blind spots and helping you connect areas you otherwise would miss out on. The importance of the individual development that a good coach can bring is greater than the individual level. There is no amount of organizational change that can happen without real change at leader level. Leaders set the culture and direction for organizations — whether they know it or not — which means that if they want to effectively bring change to an organization, they’ll have to bring change to themselves. This is not an easy task. One way a good coach can help a leader, and therefore an organization, grow, is by growing the leader’s self-awareness. One tool a coach can deploy to achieve the goal of self-awareness is the Johari window. Abilitie was thrilled to partner with Amy Speranza and Jaclyn Courter to present Abilitie's third Learning Leader Roundtable, our first in New York, NY. The foundational topic of the event was "How to develop high-potential leaders online," though the conversation spanned all the big issues that learning programs face today! Attending learning leaders represented organizations in the Fortune 100, non-profits, startups, and the global public service sector. In the programs represented, the demographic most frequently engaged in hi-po programs was recent graduates and entry-level, followed by managers, and then the executive level. The three most popular elements to include in hi-po learning programs were action learning group projects, personal assessments, and traditional classroom training. The least popular element to leverage for hi-po programs was job rotations. Participants surveyed reported that 5 years ago, only about 20% of their training took place online while today closer to 47% of their training takes place online. They predict that in 5 years, about 60% of their hi-po training will take place online. Just because the platform is virtual doesn't mean the connections can't be real. Online programs are successful only when there is an element of socialization and community. In virtual settings, variety truly is the spice of life. Don't expect the same platform or medium to work in every phase of the program. Variety keeps learners engaged. Be ready for the long haul in showing ROI. There are many ways to demonstrate the value of learning, but to demonstrate long-term value, consider intermittent follow-ups and check-ins with participants for years to come. Once again, a huge thank you to Amy and Jaclyn from GE for partnering with us to present this Learning Leaders Roundtable. There's nothing like engaging with our community to get us excited about the future of learning and development! We are very excited about our upcoming L&D Leader Roundtables: in Washington D.C. on May 2 and New York, NY on May 22. 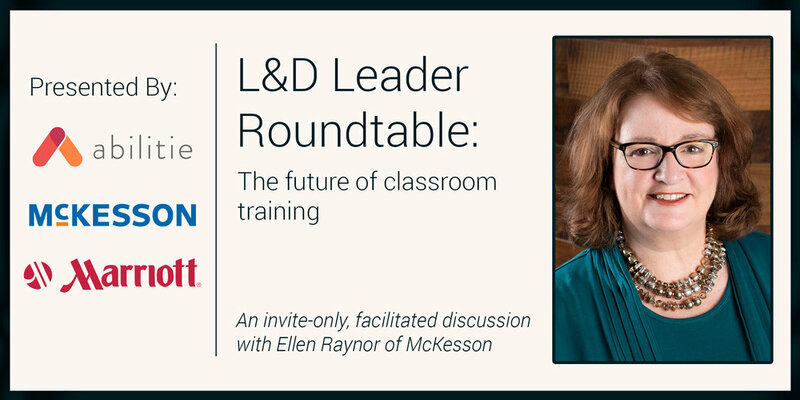 For our May 2 event we have partnered with Ellen Raynor of McKesson to facilitate a discussion with regional L&D leaders on the topic of classroom leadership development -- is it here to stay? or will it struggle to find a place of importance as virtual and distance options become more viable? 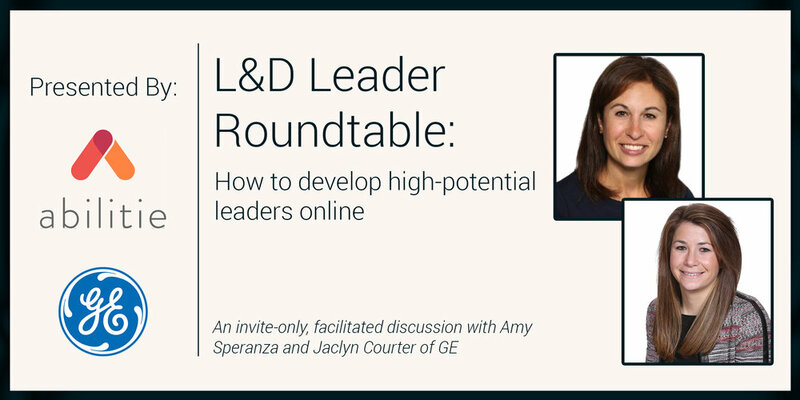 At our May 22 event, Amy Speranza and Jaclyn Courter of GE will provide guidance for a discussion around transitioning L&D programs from being solely classroom based to blended formats. We expect an excellent conversation asking questions of "When should you move to a blended format?" and "How do you maintain the high levels of success that you expect in your traditional formats?" If you're interested in joining us for either of these events, please fill out the below contact form and we'll be in touch!